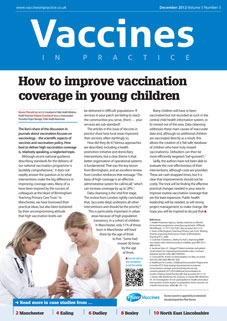 Launched in 2008, Vaccines in practice provides a broad blend of articles of interest to all those involved in immunisation and vaccinations, in both primary and secondary care. Supported by a multidisciplinary Editorial Board, the journal offers updates, guidance and practical advice that reflects current thinking in this area of disease prevention. The current issue is available as a PDF, EPUB for your iPad or smartphone, and Kindle. You can also browse back issues to the left, or search the archive to the right. To buy back issues of the journal in print, visit our webstore. Editor: Peter M English MB ChB FPCert MRCGP MPH MFPHM Consultant in Communicable Disease Control, Surrey and Sussex Health Protection Unit, Health Protection Agency, Leatherhead, UK. Vaccines in practice was previously supported by Pfizer Vaccines from 2010 to 2012 and by Wyeth Vaccines from 2008 to 2009. The data, opinions and statements appearing in the articles herein are those of the contributor(s) concerned; they are not necessarily endorsed by the sponsor, publisher, Editor, Editorial Board or authors’ employers. Accordingly the sponsor, publisher, Editor and Editorial Board and their respective employees, officers and agents accept no liability for the consequences of any such inaccurate or misleading data, opinion or statement.